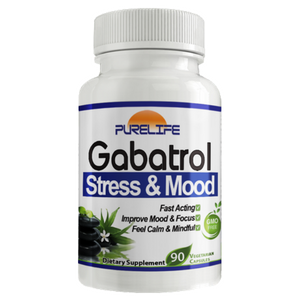 Gabatrol works fast to help boost your mood and calm your mind. Its unique blend of ingredients work together to enhance brain function and increase GABA, the #1 calm and happy neurotransmitter in the brain. When your GABA levels are higher, you’re more relaxed and focused. You feel great and think with mental clarity. Negative emotions affect your body, thoughts, and behavior. They can result in increased blood pressure, fatigue, and poor daily habits. It is important to maintain proper emotional health to help put yourself in the best position to succeed mentally and physically. As a dietary supplement, adults take 2 capsules on an as needed basis. Gabatrol works best on an empty stomach. WARNING: Keep out of reach of children. Not intended for those under 18 years of age. Gabatrol may increase sensitivity to alcohol. Do not drive or operate heavy machinery if consuming Gabatrol with alcohol. Consult with a physician if pregnant, nursing, or on anxiety medication. Do not exceed 4 capsules per day. Sceletium Tortuosum (Kanna): An herb that boosts serotonin and dopamine levels. It has been used to treat stress, anxiety, and depression in South Africa for centuries. It can also help to curb appetite. Tyrosine: An amino acid that boosts mood, increases alertness, and relieves depression. This product is a life changer – amazing! Great for those days you feel down, stressed and just needing help. The best non-pharma product ever for stress, anxiety and to increase will power! Everyone in my family has used it for over 7 years. Amazing how fast it works: only 20-30 minutes in my case. I only use it when I need it and, as an added bonus, I sleep like a baby! Thanks a million! Amazing product that actually works. I recommend it to everyone I know: My Dad for sleep, Mom for work related stress, Sister for mood, friends for creativity and school…the applications are endless. I’ve only had good experiences with the company too. Everyone is really professional, knowledgeable, compassionate, and down to earth. I love their philosophy that emotions drive physiology so if you have a happy mind you can change your life. So far it’s been true! I personally use it for emotional stress and music (writing and performing). Thank you! This is unbelievable. A Miracle. I was on every drug in the world. This actually stopped my chronic 40 years of panic fear and rage. I was stuck in fight or flight. Finally relief! God Bless You! Awesome, works better than prescription drugs that mess your mind up!